Email your birthday month, and we’ll add you to our “Birthday Club!” We will send you a 20% off coupon via email. She's back for a trifecta! The Poll we posted had a tie, so why not have both classes! 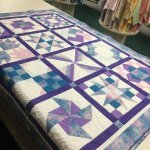 "Welcome to the fun world of CREATING with your MASTER Top Pattern! Choose any type or weight knit those appeals to you. My favorite knit fabric is Sophia. Just make sure it is 60? wide. Two of these garments have angled hems and the center one has a princess line." The Dolman Sleeve Class will be held on; Tuesday April 30 4p.m. - 9 p.m. $80 for one class Take 2 or 3 of Judys Classes and take them for $65 EACH! She's back for a trifecta! The Poll we posted had a tie, so why not have both classes! The Lady Legs Class will be held on; Tuesday April 23 4p.m. - 9 p.m. $80 for one class Take 2 or 3 of Judys Classes and take them for $65 EACH! Here is your chance to learn smocking. You will learn basic smocking techniques and accent stitches to make finished a garment. These beautiful pieces are cherished by whomever gets to wear it. Come in store to avoid Processing fees! 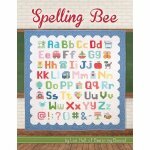 Lori is putting together a BoM using Spelling Bee by Lori Holt! Each month you will make a new block from the book and at the end you will have a cute retro quilt!